Athaliah is an evil woman. She encourages her son, the king, to act wickedly. He does and is soon assassinated. Then Athaliah seizes control and asserts herself as queen. Her lust for power is so great, she kills all the members of the royal family, including her own grandchildren. One baby, however, is rescued by his aunt, Jehosheba. His name is Joash. Six years later, he, the rightful heir to the throne, is crowned king by the priest, with the support of the Levites and heads of the leading families. Athaliah accuses them of treason and tears her clothes to express her outrage. But she can’t change what has happened. At the direction of the priest, the army kills her. The country celebrates her death and calm returns. Athaliah could have positively influenced her son and helped him rule wisely. She could have protected and groomed his successor. Had she done so, the people would have celebrated her life; instead they celebrated her death. 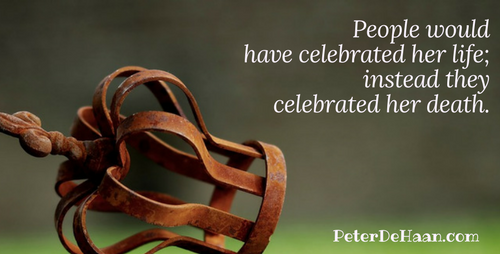 Is our life worthy of celebration? This was a hard one to cover. But true evil does exist in our world.